“The Bouquet residence, the lady of the house speaking!” Not really Bouquet is it? It’s Bucket. This is a handful of series shown on my PBS station in the 1990’s that I absolutely loved. Keeping Up Appearances. The series about a woman who goes through incredible lengths to have others believe she is in a higher social standing than she really is. To be able to pull this off, she often hides the family members she embarrassed of from other people, plays up her own social standing, assumes that other people of higher standing knows her and should acknowledge her, and talks up her husband as someone who is more important than he is much to his embarrassment. This week I look at 2 *Holiday* specials from the series. These were Sea Fever and Historical Pageant. Going into it and picking the episodes to watch, I knew that they were not yuletide spirited choices and I didn’t care. Christmas was still a few weeks off so it didn’t bother me too much. They originally aired on BBC1 on 12/25/94 and 12/24/95 respectively. Historical Pageant is actually the last episode of the series and I have never seen it before. The PBS station in my area show these series continually but the way that BBC Worldwide Americas offer the series, they will take out the Christmas specials from the rotation and the stations will need to purchase these episodes separately. This is why watching this series on PBS one will never see it straight through from beginning to end. Generally, the Christmas specials will show up in December (hardly a radical idea) but will be also placed in that month because that is when those stations have pledge drives to try and get money out of viewers to support the programs. This is supported by my BBC Worldwide Americas syndication information about Keeping Up Appearances where a station can purchase series 1-5 sans Christmas specials. It does separately point out 4 specials for purchase. This would also possibly explain why I never seen Historical Pageant as I just simply missed any of the Christmas specials when broadcast on my PBS station. To be honest, I have only seen 1 of the 4 listed specials on my PBS station, The Father Christmas Suit. Sea Fever and Angel Gabriel Blue I owned the pre-recorded video. I chose Sea Fever because I always liked it. I liked how it got all the regulars (minus Daddy) into the special but also allowed them to not be in the entire special. Emmet and Elizabeth are in the early part of the special. 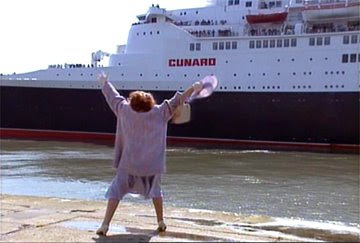 Rose is seen for a little bit but the episode revolves around Hyacinth and Richard going on a cruise on the QEII. It takes them forever to get to the ship including them actually missing its departure and catching up with it elsewhere. This is all due to Hyacinth thinking she can navigate Richard to the QEII better than Richard’s own directions. Once they finally get on board ship, Hyacinth sees Onslow and Daisy on the ship and Hyacinth immediately believes that they are stow-aways. The truth is that Onslow and Daisy won the cruise and did not want to tell Hyacinth in case it made her jealous. The best scene of the episode is when Onslow and Daisy start the dance at the end of the episode and Hyacinth breaks in and dances with Onslow. Now that is at the end of the episode, what about everything in between? I like much of the episode because it gets the characters out of their normal surroundings. What is annoying though is Hyacinth. I know her character is meant to be annoying and rubs people the wrong way. This time, she just bugs me. Hyacinth in the series is a strong and tough woman. She can deal with any crisis in often amusing ways. In Sea Fever, she gives up too easily. She is reduced to tears too often. That just doesn’t feel right for her character. Once she finds out that Onslow and Daisy are on board after winning the trip, that’s different. She is just jealous and it is funny. When she is crying because she missed getting on the QEII the first time just does not feel right to me. Of course, as an American Football fan, see her searching the ship for Onslow and Daisy in a Minnesota Vikings hat is a treat. After all, I come from Minnesota. I also thought this episode was a little timely because the QEII made its last voyage this year to be docked in Dubai to be turned into a luxury hotel. I enjoyed Historical Pageant a little more. Often, I see that with Christmas Specials from the UK that episodes are kind of pantomime in nature. Are You Being Served? does it as did Doctor Who Voyage of the Damned. Oh, that wasn’t meant to be pantomime? Anyway, Historical Pageant is about Hyacinth organizing a pageant for the church. She is to play the Queen in the pageant and she is looking forward to all the volunteers to help her put this pageant together. Of course, once everyone in the parish realizes that Hyacinth is running the pageant, no one shows up to help. Hyacinth needs to get her family involved including Onslow. The Vicar is set to see the play but immediately considers it to be unacceptable and asks for the curtain to be lowered based on Hyacinth’s appearance as the Queen. As it is lowered, it hits Hyacinth on the head sending her to the hospital. This is a one of a handful of occasions we see Hyacinth’s sister Violet and her husband Bruce who are always fighting and talking about divorce. 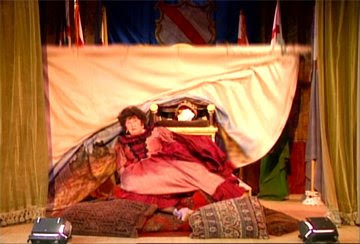 As this was the final episode of the series and that I have never seen it before, I had seriously wondered if Elizabeth dropping the curtain on Hyacinth’s head would kill her. It actually makes sense since Elizabeth is so clumsy she breaks Hyacinth’s cups in every episode. Hyacinth also bullies Elizabeth too. This would have been a satisfactory ending to the series for me. I like to think that on her way to the hospital she quietly passes away. Well, she could have done so! After 5 years of the “Hello Mrs. Bucket, I mean Bouquet!” joke it was time for the series to end. I have stuck up for the series after people thought it should have been done after 1 series of the same type of humor. 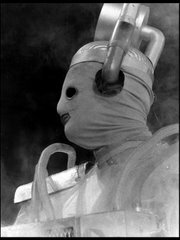 I have always loved it but it is clear by this episode, the ideas have run out of steam. Too many unfunny pieces to it including Daddy and the dance instructor dancing continuously through different parts of the story. Though, it was fun to see Una Stubbs make an appearance. I watched this from the BBC R1 set. I thought the episodes looked softer than they should. Most of the other BBC comedies on DVD look great. I was not sure if that was because some were recorded on 2” quad tape which would give a stronger picture vs. 1” tape. I am not sure what Keeping Up Appearances would have been recorded on but it is possible to start off in 1” and end up on D3. I also have the R1 release of Grace and Favour which looks real good and was done at around the same time of Keeping Up Appearances. 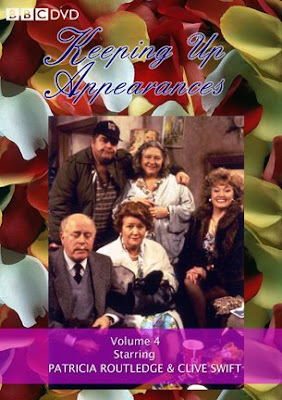 It is possible the episodes for the Keeping Up Appearances release was sourced from the BBC Worldwide Americas analog tape library. I have not seen the R2 Playback release of the series though all my ‘Allo ‘Allo! discs are from the R2 Playback collection and look good. When I first went through all of the episodes for Keeping Up Appearances, I always thought Richard was going to get a backbone, have enough and leave Hyacinth to go off with Elizabeth. Now that I have finally seen the final episode, I know that is not the case….sadly. A quick shout out: One of the few BBC comedy series I have never seen episodes of is Last of the Summer Wine. I just want to give my condolences to the family of Kathy Staff who died last week. I have wanted to check it out but am a little unsure of watching 29 series of something right now. Next Week: True Christmas episodes of the classic series of Are You Being Served? with Christmas Crackers and The Father Christmas Affair.